Patient Gary Wells works with physical therapist Travis Dennis on stance control and balance with the Maxi Move dependent lift device. 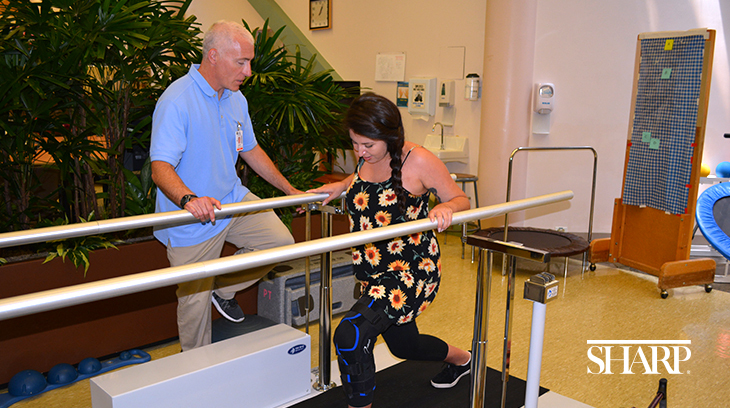 Patient Lauren Huey works with physical therapist Dan DeBeliso after an accident in Thailand left her unable to walk for weeks. 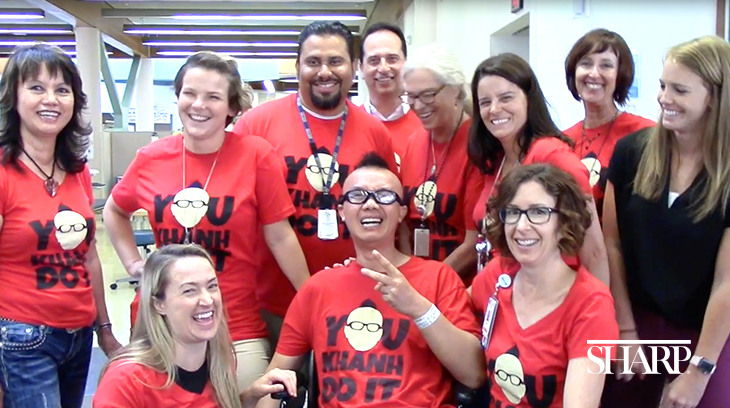 Patient and stroke survivor, Rodney Nguyen (front, center) with employees at Sharp Grossmont Hospital Rehabilitation Center, all wearing a custom shirt with his image. The shirt is worn by his supporters around the world. World-famous environmentalist, animal conservationist and stroke survivor Joan Embery during one of her physical therapy sessions. 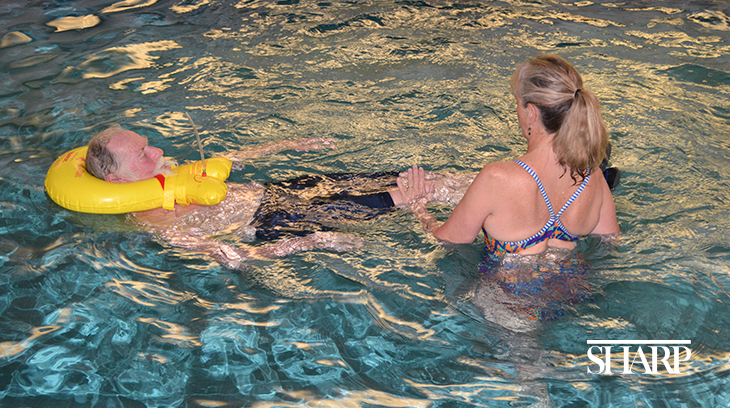 Recreational therapist Liz Clarno works with stroke survivor David Moody during her Adapted Aquatics class. 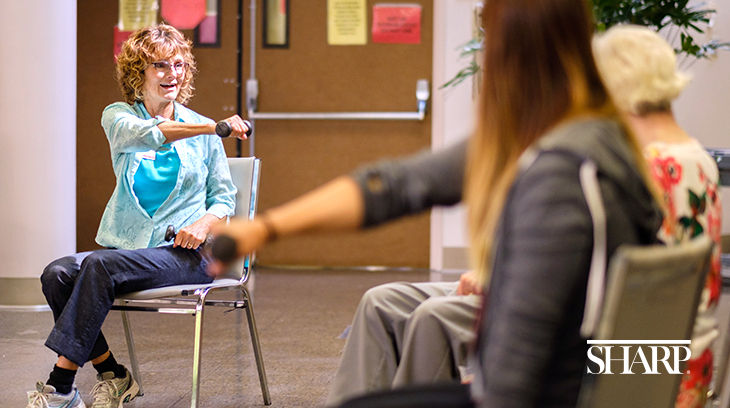 Recreational therapist Grace Latimer leads a Gentle Chair Fitness class, designed for people with physical limitations or who are looking for a gentle form of exercise. 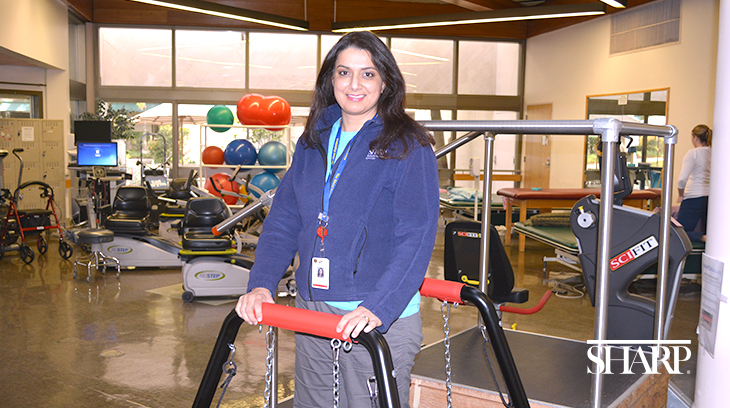 Physical therapist Pamela Singh demonstrates a stability exercise she teaches to patients with Parkinson's disease. Occupational therapists Cathy Hamm and Darlene Bickett demonstrate the Music Glove, a therapy tool that improves fine motor skills by helping patients regain timing and coordination in their fingers and hands. Sharp Rehabilitation offers an adaptive golf clinic for individuals with physical challenges, led by recreational therapists and a PGA teaching professional. After discovering that two of his patients, Lynn and Ron, shared a love for music, Dr. Franklin Kalmar introduced them and they became fast friends. 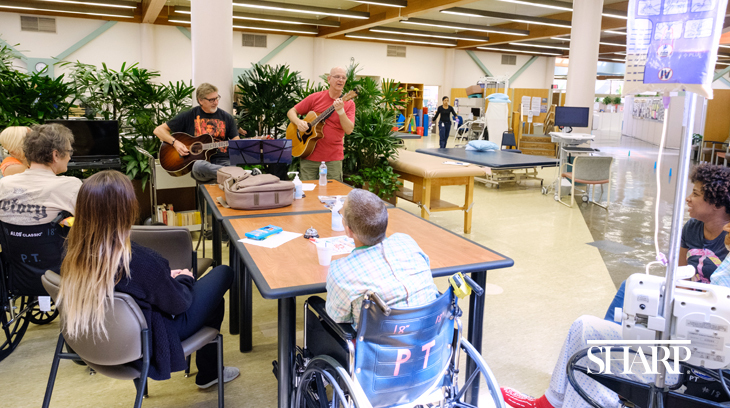 Friends and local musicians, John and B, volunteer by playing music for rehabilitation patients and staff. 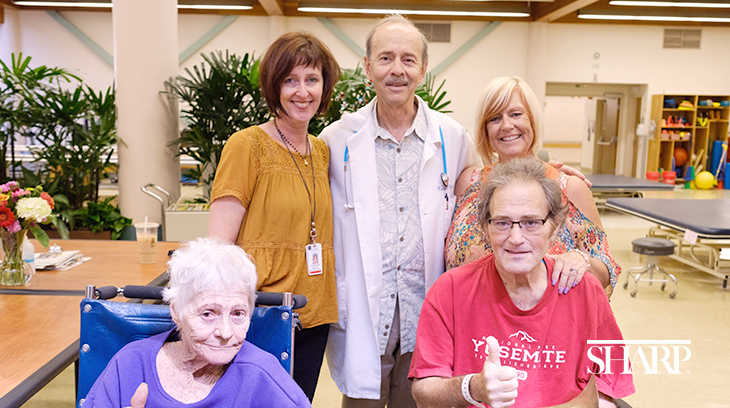 In the past 40 years, more than 130,000 patients have been treated at Sharp Grossmont Hospital’s Rehabilitation Center. Many were injured or experienced life-changing medical situations. All of them work with a team of professionals dedicated to improving or restoring their ability to lead independent, productive and fulfilling lives. It’s hard to believe that before the Rehabilitation Center opened its doors in 1977, San Diego had few services for people with disabilities. But that all changed under the vision of Dr. Jesse Bowers. His interest in rehabilitation was not something he had planned on, but happened as a result of a life-changing event. In 1961, 36-year-old Bowers, a Navy medical officer and flight surgeon, was stationed at North Island Naval Air Station in Coronado when he was called to retrieve a patient on the USS Pine Island at sea. The flight crew was taking off to return to San Diego when the helicopter’s rotors hit the ship, causing it to flip on its side. Dr. Bowers fractured his back on impact. 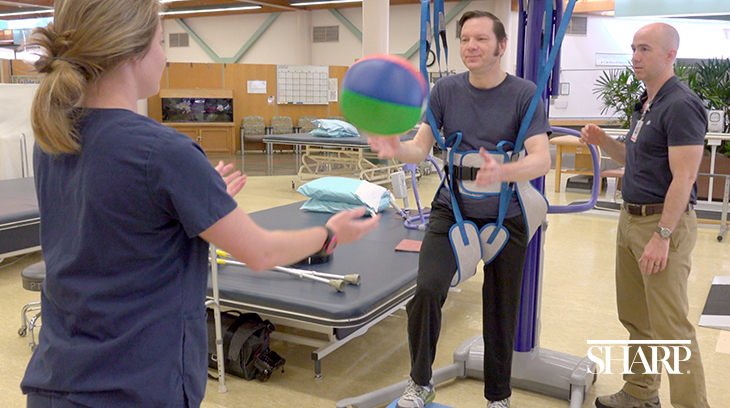 Exposure to physical therapy and rehabilitation after his accident opened Dr. Bowers’ eyes to the incredible needs of patients with spinal cord injuries. His experience allowed him to be empathetic in a way other doctors could not be. He became passionate about educating his colleagues and helping patients return to productive lives. In 1977, Sharp Grossmont Hospital’s Rehabilitation Center opened with Dr. Bowers as medical director. The facility was the first comprehensive rehabilitation center to serve San Diego’s East County, focused on treating conditions such as stroke; brain and spinal cord injury; multiple traumas; and joint replacement. Dr. Bowers was a strong supporter of a team approach to patient care, believing that every caregiver plays a critical role. Today, Sharp Grossmont Hospital’s nationally recognized Rehabilitation Center offers a range of therapies and specialized nursing designed to meet patients’ individual needs, including physical, occupational, orthopedic, recreational, aquatic, hand and speech therapy. The facility also houses the most accredited stroke rehabilitation program in San Diego. Even as the center has changed and expanded over the past four decades, the emphasis on the connection between patient and caregiver has remained the same. The environment in the Rehabilitation Center at Sharp Grossmont Hospital is close-knit, and according to employees and patients alike, feels like one big family. On any given day, one might find a celebration for a patient, catch some of a volunteer musician’s performance, or meet someone who returns year after year to visit therapists, nurses and doctors who helped rehabilitate them. The supportive, healing environment envisioned by Dr. Jesse Bowers 40 years ago has truly withstood the test of time. Learn more about Rehabilitation Services at Sharp Grossmont Hospital. For the news media: To talk with Joy Fetherlin about Sharp Grossmont Hospital Rehabilitation for an upcoming story, contact Erica Carlson, senior public relations specialist, at erica.carlson@sharp.com.